We are now offering a visiting service allowing you to experience our first class fitting service from the comfort of your chosen location whether that be at home or work. A £50 deposit fully is refundable with a suit purchase. To speak to us and find out more please call 0207 928 9558 or click here to send us an email and one of our team will call you back to arrange a visit. In these conditions references to "the Company" are to D2K UK Limited and references to "the Purchaser" are to any person, firm or company with whom the Company enters into any contract whether directly or indirectly. All quotations or tenders given and all orders received and accepted are executed on the basis that the Purchaser is bound by these conditions of sale. Where there is any inconsistency between these conditions of sale and any conditions or other terms which the Purchaser seeks to impose these conditions of sale shall prevail. These conditions supersede any other terms appearing elsewhere and exclude and override any other terms or representations stipulated or incorporated or referred to by the Company whether in the order or in any negotiations or course of dealings established between the Company and the Purchaser. No amendment or variation of these conditions will apply unless confirmed in writing by a director of the Company. accepted by and concluded with the Company (“the Purchaser’s contract”). Unless otherwise agreed in writing, all orders are accepted by the Company subject to the prices and any related discount applying at the date of the Purchaser’s contract and contained within any price list of the Company whether published or not and shall not affect the right of the Company to charge for Goods in accordance with this clause. The charges involved in the carriage of the Goods to the Purchaser are included within the contract price stated in the Purchaser’s contract or otherwise referred to upon the Company’s website or in these Terms and Conditions. An extra charge will be payable for all deliveries outside the United Kingdom mainland. The amount of such charges will be shown in the Purchaser’s contract and will vary from time to time dependent upon the location address of the Purchaser. Where the Purchaser has ordered the goods directly from the Company’s website, the contract price shall be due in full (by way of credit, debit or charge card) on the date upon which the Purchaser’s order is accepted by notification given by internet by the Company to the Purchaser. Such acceptance shall be given in writing by internet by the Company to the Purchaser within two working days of receipt of the Purchaser’s order by the Company at which time the Purchaser’s contract shall come into legal effect and the date of the giving of such acceptance shall be deemed to be the date of it. The Company reserves the right not to despatch the Goods or any of them until such time as the validity of such credit/debit/charge card transaction has been confirmed by the appropriate financial service provider. Time for payment of the contract price is of the essence. Title in the Goods shall remain the property of the Company until the Company has received all payments which are owing to it by the Purchaser on any account whatsoever. While the Goods remain the property of the Company the Purchaser shall hold them as bailee on behalf of the Company and shall keep them safe, insured, separate and identifiable from all other goods in his possession. Any dates quoted for the despatch, repair or replacement of the Goods are to be treated as estimates only and time shall not be of the essence. The Company shall not be liable for any loss whatsoever arising as a result of any delay. Delivery shall occur on the despatch of the Goods from the Company's premises by carrier whether or not the carrier is the Company's agent or servant. Unless otherwise agreed in writing the Company shall deliver the Goods to the address specified in the Purchaser's order. and the goods are not sold by description or sample. The Company shall not be liable for any claim or claims for any damages whether direct, indirect special or consequential or economic damage of loss (including loss of profit or goodwill) arising from any breach by its contract or any defect in the Goods. Nothing in these conditions shall exclude liability of the Company for death or personal injury resulting from its negligence insofar as the same prohibited by United Kingdom statute. (b) be reasonably fit for purpose. The Company shall not be liable for a breach of any of the above warranties unless the Purchaser gives notice by registered or recorded delivery post or its equivalent in writing to the Company of the defect within five working days of the delivery of the Goods to him. (b) the Purchaser fails or failed to follow the Company’s written instructions as to the measurements and any other ancillary procedures necessary to enable the Goods to be manufactured in accordance with the Purchaser’s contract. The Purchaser warrants that he has fully complied with all the Company’s written instructions as to measurement and otherwise and that the particulars thereof are fully and faithfully contained within the Purchaser’s contract. If any of the Goods do not substantially conform with the details contained in the Purchaser’s contract or any of the Company’s warranties stated or otherwise referred to in these Terms and Conditions, and is not capable of alteration in the locality of the Purchaser (most local dry cleaners will have an alterations tailor) the Purchaser may give notice in writing (by way of recorded delivery or registered post or its equivalent) within five working days from receipt of the Goods that the Purchaser considers that the Goods are not to specification and outline the respects in which it is not considered suitable. The Purchaser shall then, return the Goods or the part of such Goods which are alleged to be defective to the Company in its original packaging. The Company shall thereafter review the position and if appropriate refund the price for the Goods in full. All postage / shipping costs outside of the UK are to be met by the Purchaser. The Company will endeavour to deliver the Goods within a specified period referred to in the Purchaser’s contract. The Company shall within two working days from the date of the Purchaser’s contract notify the Purchaser of the expected date of completion. Thereafter the Company shall despatch an email to the Purchaser when the Goods have been despatched from the Company’s premises to the Purchaser. If the goods have not thereafter been delivered to the specified location within 28 working days the Purchaser shall contact the Company by email or telephone, and may claim a refund if necessary. Where the Company has informed the Purchaser of some delay and a subsequent time for delivery which shall exceed 30 working days, the Purchaser may choose to accept this delivery date, or claim a refund. All descriptive and forwarding specifications, drawings and particulars of colours and sizes issued by the Company are approximate only and are intended only to present a general idea of the goods to which they refer and shall not form part of the Purchaser’s contract. If the performance of the Purchaser’s contract or any obligation under it is prevented restricted or interfered with by reason of circumstances beyond the reasonable control of the party obliged to perform it the party so affected (upon giving prompt written notice to the other party) shall be excused from performance to the extent of the prevention restriction or interference but the party so affected shall use his or its reasonable endeavours to avoid or remove the cause of non-performance and shall continue performance under these Terms and Conditions with the utmost despatch whenever such causes are removed or substantially diminished. The Company may add to, change or remove any part of these Terms and Conditions at any time, without notice. Any changes to these Terms and Conditions or any terms shown on its website or any sub site hereof, apply as soon as they are displayed. By continuing to use the website after any changes are displayed, the Purchaser acknowledges his acceptance of such changes. The Company may add, change, discontinue, remove or suspend any other content displayed on its website, including features and specifications of products and services described or depicted on the website, temporarily or permanently, at any time, without notice and without liability. including, but not limited to, indirect or consequential loss or damages, loss of data, income, profit or opportunity, loss of or damage to property and claims of third parties, even if the Company have been advised of the possibility of such loss or damages or such loss or damages were reasonably foreseeable. If this clause is unenforceable in whole or in part in any jurisdiction due to relevant laws, then in no event shall the Company's total liability to you for all damages, losses, and claims (whether in contract, tort (including, but not limited to, negligence), or otherwise) exceed the amount paid as consideration within the Purchaser’s contract. The material on the Company’s Website is provided “as is”, without any conditions, warranties or other terms of any kind. Accordingly, to the maximum extent permitted by law, the Company provides the Purchaser with access to the website on the basis that the Company excludes all representations, warranties, conditions and other terms (including, without limitation, the conditions implied by law of satisfactory quality, fitness for purpose and the use of reasonable care and skill) which but for this legal notice might have effect in relation to the Website. The Purchaser agrees that he will only use the Company’s website in a manner which is consistent with these terms and conditions and which complies with applicable laws and regulations. In particular the Purchaser agrees that he will not use the web site to upload or send any material which contains software viruses or other codes, files or programs designed to interrupt, destroy or limit the functionality of any computer software, hardware or telecommunications equipment or in any other manner which would interfere with or disrupt the website. The Purchaser acknowledges that the Company’s website and any Goods obtained therefrom are provided for the personal use of the Purchaser only and will not be used for any commercial purposes or distributed commercially without the prior written consent of the Company. All content included on this site including but not limited to website design, text, graphics, audio clips, visual clips, logos, button icons and the selection and arrangement thereof are either the property of the Company or its contents suppliers and are protected by UK and international copyright laws. All software used on this site is the property of the Company and is protected by UK and international copyright laws. Permission is granted to electronically copy and to print in hard copy portions of the Company’s website for the purposes of placing an order with the Company and using the website as a shopping resource only. The Purchaser further agrees that any other use of materials on the Company’s website including reproduction for purposes other than those mentioned above, the modification, distribution, transmission, broadcasting, republication, downloading or uploading without the prior written permission of the Company is strictly prohibited. All brand names, product and service names and titles and copyrights used in the Company’s website are trademarks, trade names, service marks or copyrights of their respective holders. No permission is given by the Company for their use by any person other than the said holders and such use may constitute an infringement of the holders' rights. The Company may choose to provide links to sites owned by the Company and associated companies from time to time and may also choose to provide links to sites that are owned by third parties that are not connected with the Company. All links are provided for the convenience of the Purchaser only. Access to sites that are owned by third parties is at the entire risk of the Company and the Company has no responsibility or liability for them. Any contract between the Company and the Purchaser whether for use of the website or in relation to the purchase of products goods or services through the website will be governed by the laws of England and Wales and the parties hereby submit to the non-exclusive jurisdiction of the English Courts. 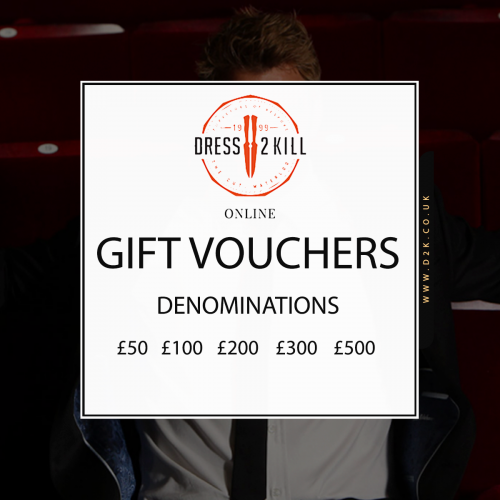 Dress2Kill website complies with the principles of the Data Protection Act 1998. Personal information provided to Dress2Kill via Dress2Kill website will be used for the purposes outlined at the time of collection. Personal data will be collected and processed by Dress2Kill for the following purposes: to provide goods and services, including marketing, advertising and promotions, unless a user elects to opt-out of receiving such communications. If, at any time, a user wants to verify, update or amend their personal data they may simple email their request to sales@d2k.co.uk. Users have the right to ask Dress2Kill for a copy of the personal data held about them and to request that Dress2Kill correct any inaccuracies in that information.